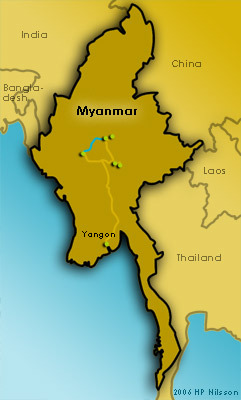 Myanmar, formerly known as Burma, is as big as Texas or 1.5 times Sweden. It has a population of 45-50 million people, making something like 76 inhabitants per square km. It has several bordering countries and through the centuries the population has become a blend of Burmese, Chinese, Thai, Cambodian, Nepalese, Indian and several minorities. The climate is tropical, divided in three seasons. Winter between November - January, Summer during February -April and the Rainy Season from may - October. At the time for my visit, late February to early march, it's already very hot. In mid day it's almost not endurable. Best time to visit is probably during the winter or like me in the beginning of the summer. From April it's simply to hot and after the rain has begun it get very wet, humid and slippery. 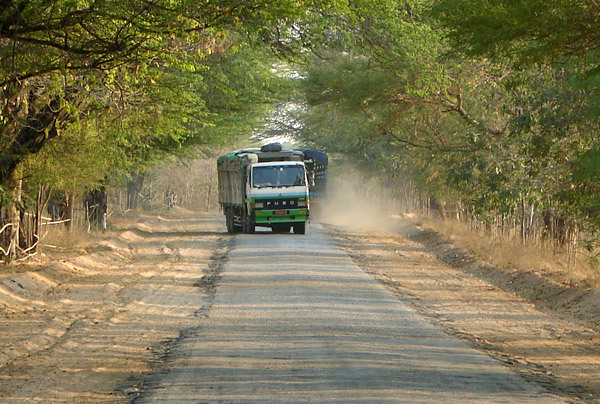 The rain turns the already bad roads into mud, making transportation and trekking very difficult. By the way, about money, it's important to know that all hotels are to be paid in US currency. In total, it's possible to survive on 15 dollars or equal Kyat a day, even less, not including transportation. The country has had it's ups and downs. After some prosperous times as a empire during the 13th and 18th century, it became a part of the British Commonwealth in 1826. This lasted until a couple of years after the WW II, when the country became independent. It soon fell in the rule of military regimes and this is still the picture. From the very first moment you notice an amazing cultural mixture. It's like the whole south and east Asia are represented inside Myanmar. Religions as Muslims, Christians, Hindus, Buddhists, and ethnical groups as Burmese, Chinese, Indians, Nepalese, Koreans besides hordes of minorities as Shan, Chin, Naga, Mon and many others. Many minorities around the borders are shared with China, Lao and Thailand. Everyone are, at least for the time being, living peacefully side by side in a way you would wish the rest of the world to learn from. 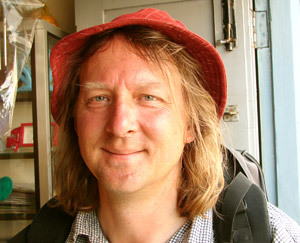 The people in Myanmar are probably among the most friendliest in the world. It's a religious place. In shops, restaurants and hotels you see a small altar, if not with a Buddha, maybe a Hindi, Christian or a Muslim icon. The majority of the population is Buddhists though, belonging to the Theravada branch like Thailand, Lao and Southern China. All over the country you find Buddhist monuments, temples, monasteries and stupas in an amount that's unbelievable. There are monument in the big cities, in the small villages, in the rice fields and in the middle of the jungle. Why so many different people has gathered here could have lots of reasons. From China probably people has come during times of wars or political unrest - As the fall of the emperor, the Japanese war or when Mao came to power. Some Chinese families seems to have lived here for hundreds of years. But I think most people has come during the time Myanmar was a part of the British India. In its way it seems to have been a prosperous time, when it was possible to earn some decent money. Of course the economy was driven by the opium trading, but no one tells you that side of the story. Today they are simply stuck here as it is almost impossible to leave the country, or even the local province. 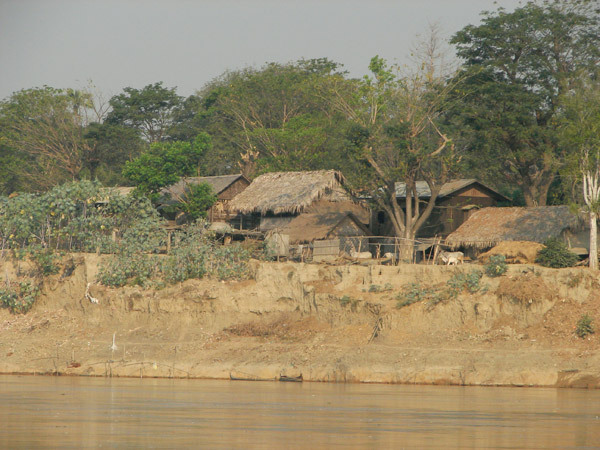 Farmer village at the Ayeyarwady River. Due to the history and the political situation the industrial revolution has yet not reached the country. Thus, the economy still relays on farming, and in some ways they are 150 years behind the western world. Yet there are satellite television, domestic pop music, music videos, internet connection. The inflation is running high, making the US dollar very expensive. The official rate is 6 Kyat per dollar, but on the street you get like 1100-1200 Kyat / US Dollar! You are simply stupid if you go to the bank for exchange. Still, black market exchange is off course illegal. Anyway, I exchanged 300 dollars, getting 300.000 funny money to carry around for three weeks in a plastic bag. After some effort to liberate the economy during the 90th, the country is now once again getting more and more isolated. Sanctions from the outer world (read USA) now has made all foreign investors to leave the country. This means there are no international bank, no international cell phone connection, and very little import and export. For you as a tourist this means you have to carry all money with you in cash (no credit cards or travel checks works). And the cell phone, you might just though it away. Well, you could use it as an alarm clock of course. Actually I think the sanctions and isolation just suites the regime fine. The less transparency, the better. You might think what's the point ruling a country with no economy? And off course there are not. The government just seems to save there own skin. Just at the moment the government is moving from the capital into a new built bunker in the jungle. A place with endemic malaria and a shortage of fresh water. Now, how clever is that? It's said that they are afraid of American attacks, but I doubt that. 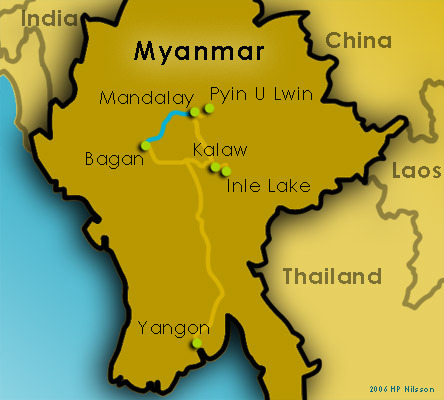 Myanmar is not a very important country, and besides it lays close to China. Instead it's said that many political decisions are made from astrological signs and fortunetellers. Well, it's only rumors off course. 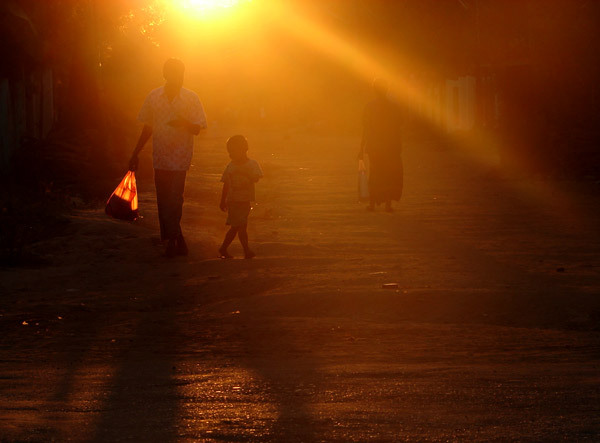 In a sad way it felt as the sun now is going down on Myanmar. A political solution doesn't seem realistic to reach within a near future and the economy just seems to get worse. What will happen with the people? A scene at the highway(! ), somewhere between Mandalay and Yangon. As you could see, not easy for two trucks to meet, but I'm impressed by the drivers who are very experienced and careful. Gas prices are running high. The official price is now 1500 Kyat (1.5 US$) per liter, but 2900 Kyat on the black market. I wonder what the Americans would say about that? Transports are therefore expensive. Being a taxi driver is not a hit as no one can afford the ride. The gas price also affects the price of electricity as it often is produced by diesel generators. You should not expect the power supply to work all the time. In fact, most of the time it does not work. The power just comes and goes randomly. 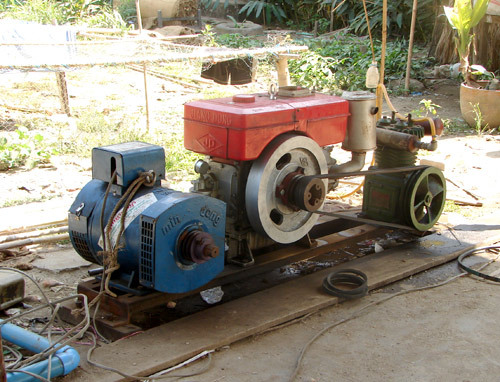 To cope with this problem a lot of shops, restaurants and hotels have their own diesel generator. Imagine the outdoor sound in the cities when hundreds, maybe thousands, of generators are growling simultaneously in different pitches and amplitudes. 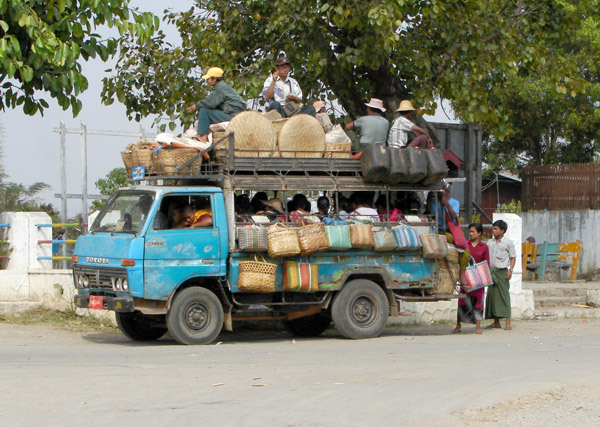 All transportation are well used as this Toyota bus leaving Nyaung Shwe for an unknown destination. I wonder what kind of engine they've put in those cars. This is probably a 70s or 80s model. Speaking about vehicles. Cars now has a special toll of 2000% (!) when imported. This makes it almost impossible to buy new cars or even spare parts. Cars and trucks are usually quite old, like from the 70th. Even in professional use. Toyota and Nissan are common brands. Especially I saw a lot Toyota Corona and some less frequently, Corolla. But still, I was surprised to see quite a lot of shining new cars, at least in the cities. Many of them were made for left side driving, meaning they came from Thailand. Maybe illegally imported, I don't know. But obviously some ones out there got plenty of money. Hmm... Seems to be a little problem here. Guess the engine is some what overheated. 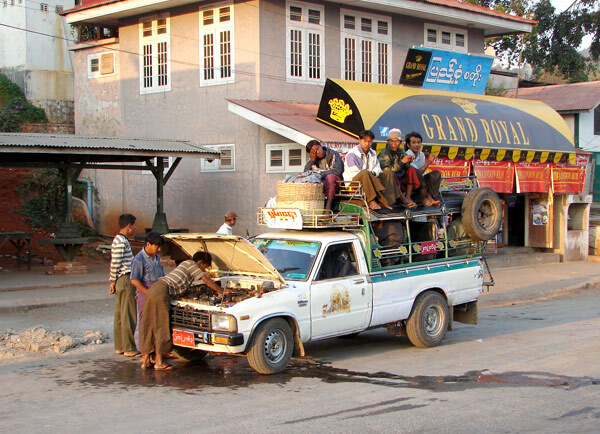 Broken cars and buses are a common sight everywhere in Myanmar. Picture from the main road in Kalaw.